Located in the Eastern portion of Ustalav in Golarian. When the light fades and the moon rises over Innistrad, humanity becomes the universal prey. Packs of werewolves emerge like the tide, drawn out by the moon, their humanity washed away by animal rage. The vampire families bare their fangs at the scent of human blood. Hordes of the walking dead lurch across the manors and moors, driven by an innate hunger for the living. Alchemically created abominations twitch to life in alchemists' laboratories. Geists haunt the huddled human towns and terrify travelers along the dark crossways in between. From Innistrad's deeper chasms, powerful demons and impish devils plot humanity's downfall, their influence spreading into all echelons of human society. The humans of Innistrad have done their best to fight back. They form torch-wielding mobs to cleanse the abominations with fire. They train specialized holy warriors, called cathars, to strike back against the supernatural horrors. Most of all, they brandish the power of their faith in the Church of Avacyn. 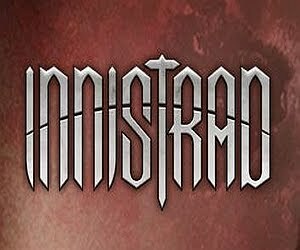 The known landmass of Innistrad is divided into four regions called provinces. The province of Gavony is where humanity remains safest and strongest. 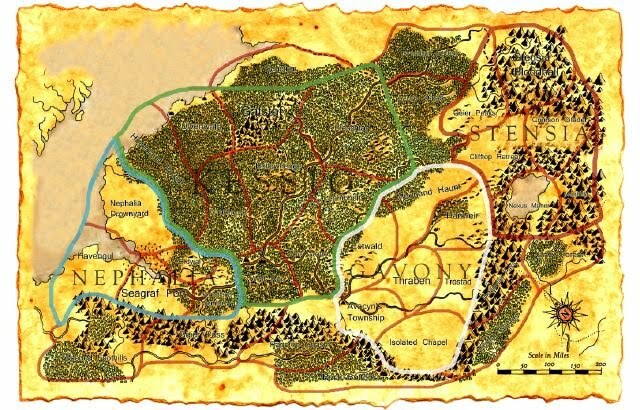 It is home to Thraben, largest city in the known world, which houses the mighty Cathedral of Avacyn, seat of religion in the world and the place where a great archangel once presided. Smaller towns radiate outward from Thraben across Gavony's rocky moors. Small copses of trees dot the landscape of rolling hills and heaths. Because more human dead are buried here than anywhere else, Gavony is more plagued by the undead than other provinces, and geists are more common as well. Innistrad's vast, wooded hinterland is called Kessig, a province in a state of perpetual autumn. The deep woods are king here, although small human communities have carved out farming villages, and groups of hunters and trappers venture into the forest to make a living. Even new arrivals to Kessig know not to venture out at night. Even if the wilderness weren't haunted, it wouldn't be safe—werewolves prowl the province, sometimes alone and sometimes in packs. Vampires control the province of Stensia, which covers the darkest and most mountainous parts of the plane. The evergreen forests here seem to always be half-dead and the roads always misty and deserted. Jagged hills hide isolated, wary human villages and vampire manors from each other. At the province's edges, the forlorn pines give way to high cliffs above which no human dares venture. In Stensia, the sun seems never to break through the strangely colored clouds. This coastal province is home to a number of small-to-medium port towns, most situated at the mouth of a river that leads further inland. Nephalia's sloughs, sea mists, and mysteries cloak its commerce and crimes; it is populated mainly by humans, geists, and vampires, all of whom seek business, secrets, or solitude. The province's silver sand beaches, punctuated with rocky promontories and sea caves, afford easiest access to its fog-shrouded ocean. and other faithful: prayers to her could cause evil creatures to turn away, silver weapons blessed by her priests could slay great horrors, and runes marked with her symbol could protect entire villages. The Church's efficacy was real and plain to see—a welcome weapon in a world of monsters. But the archangel Avacyn has not been seen over the last few seasons, and her absence is beginning to tell. Since Avacyn has disappeared, prayers have not spared remote villages from werewolf attacks as they once did. Holy symbols have not stopped vampires from preying on travelers in the high mountain passes. The dead are not protected from tampering by ghoulcallers and flesh-animating alchemists called skaberen. If the elders in the Church, including Mikaeus, the ruling Lunarch, know what has happened to Avacyn, they've given no word. It may be that Avacyn has truly vanished. What was once humanity's greatest weapon has abandoned them, and the Church's power to hold back the dark forces of Innistrad is beginning to wane. tormented spirit, mutilated corpse, or undead abomination, as so often happens on Innistrad. The Blessed Sleep is considered a reward for a virtuous and vigilant life. "May you spend an eternity in the ground" is a common blessing among the people of Innistrad. Innistrad's moon is both a source of hope and a harbinger of woe. Many Innistrad astronomers believe that the moon is a vast desert made of grains of pure silver, and that any extant silver on Innistrad originated from the moon. Cathars and priests know the power of specially blessed silver to harm werewolves and ward off other horrors, so the moon has become associated with the divine strength of the archangel Avacyn. Some even perceive the shape of a heron in the areas of dark and light on Innistrad's moon, and so the heron has come to be a symbol of Avacyn. But the rise of the moon can also dampen protective magic and cause werewolves to transform from human to wolf. The fickle silver moon seems both to serve humanity and to bring out the worst evils within. Innistrad humans also name the world's seasons by different aspects of the moon, as it seems hold a strange influence on the world as the seasons change. time, when farmers toil late in the fields until after twilight. The bonfires are thought to keep the vampires away. considered to be the time when werewolves are the strongest. Since there are more humans hunting and traveling in the woods during these months, werewolf attacks are more prevalent. The humans believe the attacks have something to do with the season itself, although there are no more werewolves at this time than any other time of year. This is as close as Innistrad gets to a spring and is the shortest season. The days are longest and the sun is the brightest, though still pale compared to some worlds, and there is new growth in the forests. Humans consider this their season, associating it with new life and birth. Babies born under the New Moon are considered to be holier, with a better chance of attaining the Blessed Sleep. Long ago on Innistrad, demons were a threat only whispered about, feared by vampires and humans alike. They were thought to be long dead, or mythical. But then Avacyn and her angels came, and with her presence a new equilibrium was reached. Vampires, werewolves, and the undead were driven back to restore the balance between humanity and the rest of the world's beings. But their retreat opened a space—an opportunity for Innistrad's infernal forces to manifest. The demons and their hosts of devils began to arrive, one by one. At first Avacyn ignored this new threat, but as the demons amassed power, she knew she would have to destroy them. One by one she would engage them in battle and defeat them. But each time she did, a new demon would appear shortly thereafter. It soon became apparent that the demons could be killed but would return in a different form, since they were beings created of pure mana. Realizing this, Avacyn decreed that "What cannot be destroyed will be bound," and thus her symbol became a silver collar, which was to be symbolically forged shut around the necks of all demonkind. Born from ancient demon-worship, the Skirsdag are now a secret demon cult centered in the High City of Thraben. This secret organization has human members in all levels of the church, nobility, and the trades. Although small, it has been in existence for generations. When the demon Griselbrand rose in power to eclipse all other demons, the Skirsdag gained prominence as well. Griselbrand disappeared around the same time that Avacyn did, leaving the humans of the Skirsdag to further his ends in their lord's absence.